It’s finally February which means I am baking all things PINK and sugary in preparation for Valentine’s Day. These cookies are so delicate, perfectly sweet, and contain the slightest tang of orange. So what are you waiting for?! 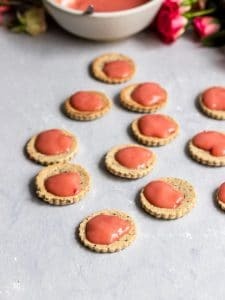 Get ready to make the ultimate Valentine’s Day cookie- Vegan Blood Orange Curd Linzer Cookies! Truth be told I LOVE Valentine’s Day! Growing up it was a chance to write Valentine’s Day cards to everyone in school and maybe JUST MAYBE get that special note from your crush. Then, when I was older and single it was a day filled with a night in (or out) with my girls, some wine, baking, and lots of chocolate. Now that I’m in a relationship, it’s a nice excuse for us to cook something special in or treat ourselves to a fancy meal out. I know there’s a lot of commercial hype around the Holiday, but to me, it’s always just a good reminder to tell everyone you care about how much they mean to you and to eat some sugary baked goods while you’re at it. This year, I’ll be recovering from my foot surgery so things will look a little different. To be honest, I may just be celebrating from the couch. Regardless, I’m not going to let this stop us from drowning ourselves in these perfectly sweet Blood Orange Cookies! Plus, who doesn’t love an excuse to eat a cookie that is heart shaped and pink?! In the spirit of the Holiday, I’ve included a few process shots that should help you while making these cookies. The most important first step is to make sure to make your curd 4-24 hours before baking these cookies. Personally, I wait for the full 24 hours because the curd really has time to “set” and become super thick and creamy during this time in the fridge. Make sure not to overcook it. As soon as it starts thickening you’ll want to remove from the heat. Believe me, it WILL get thicker over time and cooking it longer doesn’t help. Don’t add too much sugar. Since blood oranges are pretty sweet, I only included 2 Tbsp of sugar in this recipe, however, that amount is definitely adjustable if you want a sweeter or more tart curd. Make sure to add in your arrowroot powder and mix before cooking. Otherwise, you will end up with some chunky and rather gross curd. Once the curd has set, making the cookies is actually super easy. First, cream your vegan butter and sugar. I use organic powdered sugar in this recipe vs. granulated because it creates a really delicate and soft cookie. Plus, creaming these ingredients together incorporates air into the dough and helps create the structure that will hold these cookies together. From there, you can really add the rest of the ingredients in at once and mix! Though the dough isn’t too sticky, I HIGHLY suggest rolling it between two pieces of unbleached parchment paper. It makes it really easy to get the dough even in height which is super important to create uniform cookies. Then, you’ll need a Linzer Cookie Cutter to cut out the dough. You’ll cut out half the cookies without the insert and half with the insert of a heart inside. Though you don’t need to bake the small hearts, I like to bake them up anyways as I think they are fun and cute! Then, right before baking, stick the cookies on a baking tray and place in the fridge for at least 10 minutes. The dough will get warm from all the rolling and handling so doing this step helps to prevent the cookies from spreading. Then, it’s time to bake! 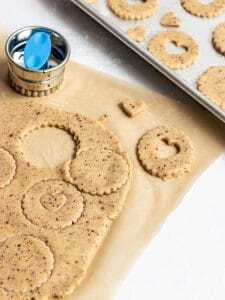 After baking, use a mesh strainer or sifter to sift an additional 2 Tbsp of sugar on top of the heart-shaped Linzer cookies. Then, spoon about 1 tsp of vegan blood orange cookies onto the bottom cookies. Finally, sandwich together and ENJOY! That’s it- a delicious Vegan Blood Orange Linzer Cookie awaits! Just remember, you can make this recipe with virtually any jam, curd, or filling you can think of. My recipes are always made to be adaptable so that the recipe works for you. This week’s recipe came early because of surgery, but next week I’ll be back on track with a recipe for another delicious curd. Happy Baking! 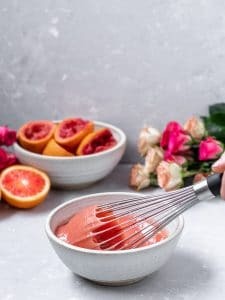 Add your blood orange juice, sugar, and arrowroot powder to a small saucepan and whisk to combine. Place the saucepan over low heat and then add in the coconut cream. Whisk the mixture continuously until the coconut cream has completely melted. Bring the curd to a simmer and cook about 5 minutes until thick. Don't let the curd bubble too hard and continue to whisk frequently during this 5 minute time period. You will know the curd is done if you lift the whisk from the saucepan and the curd very slowly drips off the whisk. Remove the blood orange curd from the heat and immediately stir in the vegan butter. Let the curd cool to room temperature and then add to a closed container. Place the container of curd in the fridge to "set" for 4-24 hours before eating! Next, add your butter and powdered sugar to a separate mixing bowl and cream together until light and fluffy. This should take about 2-3 minutes in a standing mixer. Once creamed, add in your flax egg, vanilla, and sifted dry ingredients and mix until a thick dough is formed. Remove the dough from the mixing bowl and use your hands to form into a large ball. Then, roll the dough between 2 pieces of parchment paper until about 1/4" thick in height. 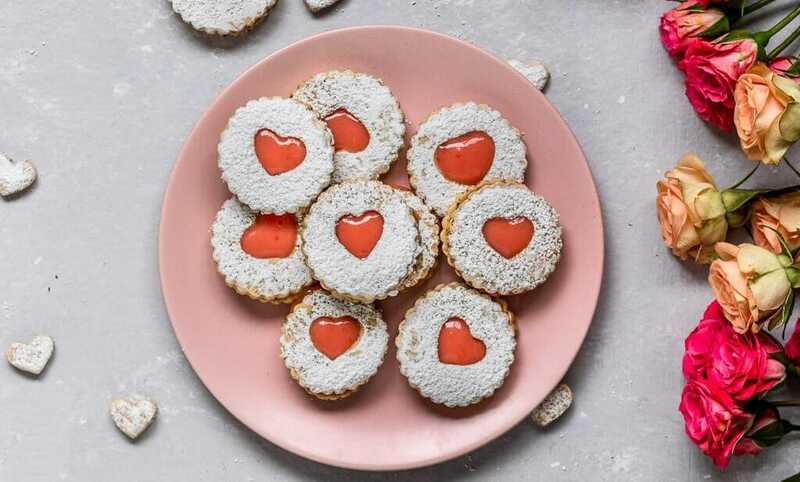 Next, use your Linzer cookie cutter to cut out an even amount of top and bottom cookies (with and without the heart-shaped insert). Each time you cut out cookies, form the scraps into a ball and roll out again until no dough is left. 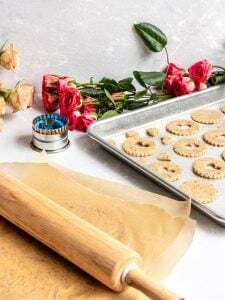 Add the cookies to a lightly greased baking sheet or a baking sheet covered in parchment paper and place into the fridge for at least 10 minutes. This step is important so the cookies don't spread much while baking. Preheat the oven to 350F while the cookies are in the fridge. Take the cookies out of the fridge and bake for 12 minutes. Remove from the oven and let cool on the baking tray for 2 minutes. Then, move to a cookie cooling rack to cool to room temperature. 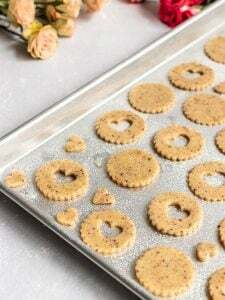 Once cooled, take the heart shaped top cookies and dust with an additional 2 Tbsp powdered sugar. Top each bottom cookie with about 1 tsp of blood orange curd. Then, sandwich the cookies together and enjoy! If you don't have time to make curd or want to try a different filling, you can make the cookie part of the recipe and fill with any jam/curd/other fillings you can think of!